The Magic Cafe Forums - Check it out! VANISH Magic Magazine #57 Out Now and FREE! A quick heads-up that the latest edition of VANISH MAGIC MAGAZINE is now out and available. The featured artist is Canadian Wonderist Chris Funk - Chris is moving up very quickly in the world of magic and his work takes him around the world. Find out his views on using technology in modern performances and HOW to use it. JOHNNY THOMPSON TRIBUTE: Nick Lewin knew Johnny for over 40 years and writes a wonderful tribute to the master of magic Johnny Thompson. We also share with readers a rare video filmed in 2017 at Magic Live. MAGIC TRICKS - great magic routines by Gregory Wilson, David Gripenwaldt, Louie Foxx, Chiem Yu Sheng, Gary R. Brown and Joe Ledoux. ARTICLES - business articles, magic related, education and magic and so much more PLUS the very first Card-A-Con convention in India! REVIEWS - the very latest magic products reviewed by our team of professionals. ADVERTS - we have Product Highlights and adverts for magic that you won’t see in any other magic publication. 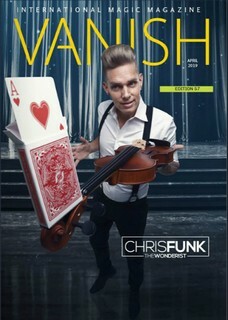 FREE digital magic magazine from www.vanishmagazine.com or open up the edition and purchase your HARD COPY - the ONLY MAGIC MAGAZINE in history to offer TWELVE different printed versions depending on your budget. Thank you for releasing this for free - devoured this last night!